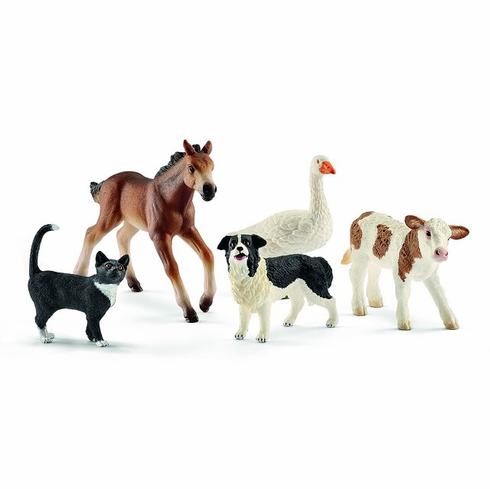 Schleich Assorted Farm World Animals. This set contains five farm animals: a Fleckvieh calf, a cat, a border collie, a goose and a Mustang foal. A Fleckvieh calf and a Mustang foal have been born on the farm. They are still a little unsteady on their feet, but they toddle boldly across the farmyard. The goose honks excitedly in greeting and the border collie sniffs them happily, while the cat sits comfortably in a sunny spot and watches the peaceful life at the farm. All the Schleich figures are lovingly hand-painted with detailed modelling. Made of synthetic material / plastic.